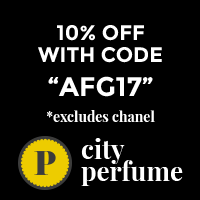 Yes, I write for Perfume Posse but I pay full price, or sale price, for all my decants, so this is not an ad. I am having a really good time getting my sniff on, instead of buying 100 x 1ml samples I got a hoard of 5ml decants. It means I really get to live the fragrance over a few wears, which is how I like to do it. Have you huffed anything interesting this week? Been to the sales? Bought, done a split on, had arrive something you’d like to share and give us all a lemming, Please do comment, we love to hear your voices. I just want you all to know how grateful I am that you visit. Thank You. You and I are so on the same page when it comes to the types of scents we like. Salina and Miele Rosa sound like perfume from the gods stolen by some modern Prometheus. As for what have I huffed of late? Yesterday as you know I got a good whiff of Un Jardin Sur Le Nile and Un Jardin En Mediterranee, Wanted to get giggy with Diorella but couldn’t find any to test. Also sidled up to Guerlain’s La Petite Robe Noir, Marchesa Parfume d’Extase,Tom Ford Black Orchid, John Varvatos, and my new acquisition, Vince Camuto. Today I am taking it easy on my fainting couch. You’ve earned it! WOW! MY nose would have shut up shop and left for holidauys after the 4th lot. Love the photos you stole for this. Sounds like you did pretty good on your picks. Haven’t huffed anything new this week. I’m hoping hubby comes home today with a fragrant souvenir from Chicago but I have a feeling I’ll probably end up with a Chicago sports team t-shirt. I like the sound of Chagrin d’Amour. I love hyacinth. Will he really get you a T-Shirt? Will you wear it? He’s home and I was correct. I now have a Chicago Bears t-shirt and cute little tote bag. I like football so I’m okay with it. He also got me a small fragrant souvenir as well. The SA got him to buy 30ml bottle of Marc Jacobs Dot. It wouldn’t have been my first choice but the bottle is cute and the juice is okay. I can wear it to work. The cutest thing was he was so proud he went to Sephora and made sure they credited the points to my beauty insider account. He did good. He could not have helped it with all the in store promo even here in Oz. It is fun and in your face. I was thinking along these lines on Saturday at the Department Store. If I was a husband and a decent SA had come to tell me how fun this was and would remind your wife of her fun childlike side I would part with my readies too. I’m on a serious rose kick (when am I not? 🙂 and I had NO idea about that Miele Rosa. Portia, you are such an awesomely fabulous enabler. That Sorrow of Love photo freaks me right the hell out, btw. Yikes!!! Okay, off to cut the grass, then sink into a scented honey and rosepetal milk bath. Yah. Musette! YOU cut the grass? Good for you. My Mum always used to do it till I was old enough. Then after I was old enough she would still sometimes do it. This past week I have take a sniffing stroll down the chic street! I was on a mission to acquaint myself with the older classic Chanel fragrances! Big surprises ! Christalle Eau Verte , and no 19 Edp and no 5 all getting my approval! I have now decided I must own them and I have a intense love for the packaging and bottle! Especially the iconic Chanel bottles ! On me Cristalle eV is like a fizzy shower of gin and tonic! I have now enjoyed an opening that is incredibly vibrant, and heavenly lemon ! It then opens and staayyysss for hours and a grassy freshness! Unisex IMO , leaning to fem! Instant perchase and already 3 compliments! Layered some Sycomore over and it was (as u say ) AH MAY ZING! GOSH! Getting out the big boys. Chanel is a good place to be. I love their scents. I was good this week: I haven’t bought a thing! 🙂 I almost bought a used bottle of Cuir de Lancome but then stopped and decided to wait and buy a full bottle. I’ve been reading about this MJoe #3, it sounds scrumdidleyumptious. Tell me when you get it how it goes please SaffyIsHere. Enjoy your Olympic Orchids, aren’t they awesome?